The Ultimate T10 HMB from Gazelle is a top of the range Bosch powered e-bike with some discerning features! The term ‘Ultimate’ conjours up thoughts of a very well equipped and refined electric bike. That’s just what the T10 HMB is all about. Thanks to Bosch’s 60Nm high torque Performance motor, the ride is pleasing, effortless and never arduous. Luxurious and ultra comfortable, the T10 adapts perfectly to each individual rider and will navigate anywhere! It makes light of hills and strong headwinds, and travels effortlessly throughout. A large 400Wh battery comes as standard, to guarantee extensive range. For those wanting to travel further and enjoy even greater thrills, there’s a 500Wh option for a modest additional price. 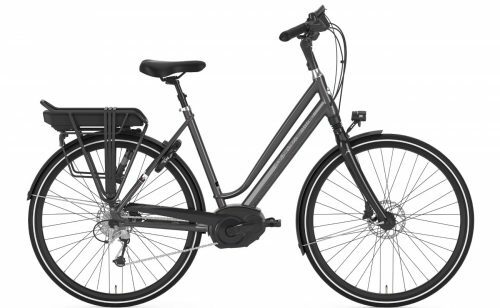 The entire range of ebikes from Gazelle are noted as some one of the most comfortable, beautifully built and elegant electric bikes on the market. The Ultimate T10 is no exception. Packed with features unique to Royal Dutch Gazelle, the T10 provides the ultimate in luxury and riding comfort. Instantly recognisable is the beautifully finish on the frame. Smooth welds, and glossy sleek lines immediately make an impact. Leather look grips add ultra comfort, while the Gazelle easy-adjust handlebar stem offers a multitude of riding positions and flexibility. Change in seconds. A nice set of Shimano SLX hydraulic disc brakes are very responsive and effective. Detailed Curana mudguards further enhance the upmarket look and feel of the T10. A suspended seatpost provides additional suspension and comfort also. Ever since 1892, Gazelle has been manufacturing the finest quality bikes that give the easiest and most comfortable ride possible. They have achieved such recognition throughout the years by their attention to detail resulting in bikes that are smooth to ride, cleverly designed and robust in quality. In fact, Gazelle are extremely proud of their frames and finish. The frame of the Ultimate T10 HMB is made from Alu 7005-T6 and is double-butted for increased strength. They are handmade and have hand-polished welds too. The Gazelle Ultimate T10 HMB comes with a 10-year warranty on the frame for on-going, worry-free cycling. In addition, there is 5 years on suspension front forks and 2 years on other components including motor and battery. The paint on a Gazelle is indestructible, as well as being rock-hard and scratch-resistant in every colour. The durability of a Gazelle is second to none. For endless fun and enjoyable rides, the Ultimate T10 HMB is hard to beat on sheer luxury!